NBDC scientists Kindie Getnet and Geremew Kefyalew recently published a research article in the Environment and Development Economics journal to further assess the development impact of rainwater management innovations through the use of a Rainwater-livelihoods-poverty index (RLPI). The article relates to research ongoing in Diga, one of the three NBDC action sites and proposes working through the comprehensive RLPI, which incorporate intermediate processes and impact pathways to understand the impact of innovations in rainwater management. The RLPI methodology is further strengthened with participatory household surveys as a way to relate scientifically generated evidence with empirical evidence and eventually inform farmers’ decisions about adopting rainwater management innovations. Rainwater management practices are often promoted with little regard for the site-specific biophysical characteristics and local socio-economic and institutional environments. To promote rainwater management more successfully, a paradigm change towards promotion of location-specific interventions is needed. Beyond biophysical suitability, successful implementation crucially depends on farmers’ willingness to adopt a practice. ‘Similarity analysis’ is an approach that presents and matches geospatial and other data so successful interventions in a location can be mapped to other locations with similar biophysical, socio-economic and institutional characteristics within a basin. Mapping similarities and differences can help us identify promising locations for technologies and other interventions to be spilled over for wider impact. Presents the available spatial data for the Blue Nile Basin in the Ethiopian highlands. Develops a methodology that allows identifying locations within a landscape that have similar biophysical, infrastructure, socio-economics, and governance characteristics relevant to rainwater management. In late 2011, all projects in the Nile Basin Development Challenge prepared ‘most significant change’ stories from the first phase of operations. One of the stories looked at how water-focused collaborative research in Ethiopia by the International Livestock Research Institute (ILRI) and the International Water Management Institute (IWMI) has evolved over the past 8 years. NBDC Brief 9 is a summary of the story. It started with research on livestock-water linkages during CPWF Phase I (2004-2008), continued through further analysis of crop-livestock production systems within a BMZ-supported project on water productivity in crop-livestock systems (2007-2009), and now has a broader rainwater management (RWM) focus on landscapes and the institutional linkages needed to achieve change through the Nile Basin Development Challenge (2010-2013). We have seen the research agenda move from water productivity to crop-livestock-water system productivity that strives for an optimal balance in allocating water resources for crops and livestock. 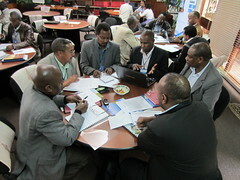 The ‘rainwater management’ concept that emerged seems to be attractive to people and organizations in Ethiopia. In particular we see uptake by those who promote watershed management as a key natural resources management strategy but end up doing soil conservation structures. RWM strategies also help national institutions move from a rainwater harvesting focus towards integrated rainwater management, and from surface water management towards integrated blue and green water in the landscape. This broader concept, with institutional, technological and political dimensions, calls for a wider participation of actors at farm, landscape, national and regional scales. Beyond the wider involvement of different actors, it calls for a greater emphasis on overall sustainable landscape productivity that addresses water depletion, land degradation, low productivity and institutional capacity. It has inserted new thinking in ongoing national programmes, including the multi-donor forum on ‘Sustainable Land Management’ which is integrating water in the national land management agenda. Closer to home, this emerging RWM concept is influencing members of the NBDC team – in terms of methodology and working approaches, particularly by moving people away from disciplinary-based research towards integrated landscape management. Shifting the focus away from research and landscape components towards wider system approaches has also brought scientists at IWMI and ILRI together in a particularly long-lasting and productive collaboration, to the extent that the two groups in Ethiopia operate as one in several projects.